Grab a FREE Citrus Lane Holiday Box Today! Citrus Lane is a monthly subscription box for newborns to age 5. Every month a specially curated box is sent to you catered to your little one's age. There are currently 3 subscription levels and subscriptions are cheaper the longer you subscribe. Subscriptions start at $29/month. But for a limited time you can grab a GREAT deal including a FREE Holiday Box! This code is valid for new OR past customers! I have included my referral link in this post. If you buy a subscription I do get credit towards my future subscriptions. You can do this too when you sign up. I think Citrus Lane is a great service and you can see all my Citrus Lane Reviews HERE. 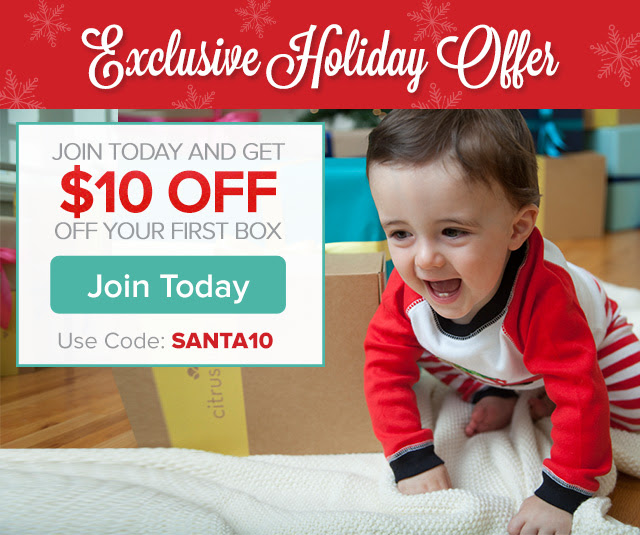 $10 off Box & Holiday Bonus Box: SANTA10 valid for new or inactive Citrus Lane customers that purchase a self-subscription. Cannot be combined with other promotions and is valid until 11:59 PM, November 15, 2014 or while supplies last. One per household. Subscriptions automatically renew to full retail price. You may cancel anytime after receiving your first box. Holiday bonus box available while supplies last and may ship separately from your first box.